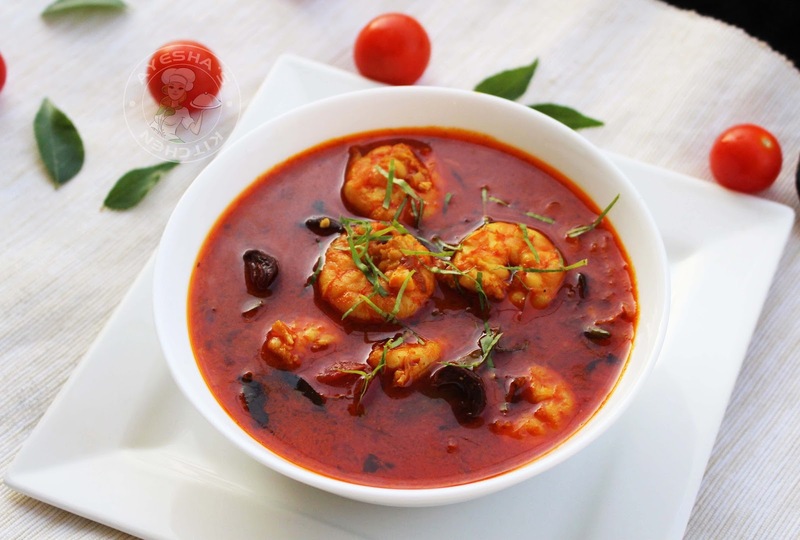 How about a spicy shrimp curry with Gambooge? This curry tastes delicious with the spices and tangy taste of gambooge / kudampuli / fish tamarind. Here i used homemade gambooge which is dried in my home by smoking, that gives this curry a special aroma and flavor. 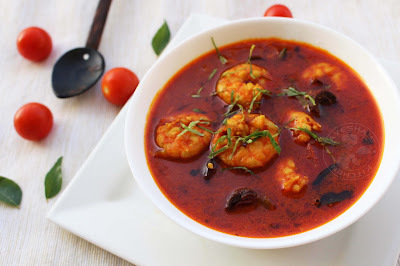 In most of the Kerala recipes especially fish curry recipes, gambooge is the sour agent other than tamarind. So here am with a kudampuli chemmeen curry which pairs best with hot steamed rice. This curry recipe is the common finger licking taste lunch meal in most of the Kerala households. Do you know the benefits of fish tamarind / pot tamarind / kudampuli? Gambooge / fish tamarind is the native fruit of Indonesia - a sour fruit commonly found in South Asia. Once this fruit is ripened, it is peeled sliced and sun dried. Then it is smoked until black. As it taste distinct, kudampuli is used in most of the Indian dishes especially in Fish recipes instead of tamarind. Kudampuli is used for making medicines too. It helps in easy digestion and solves all stomach related problems. Moreover it helps to reduce blood cholesterol level and increase our immunity power. So it is thus considered to use gambooge / kudampuli than normal tamarind. 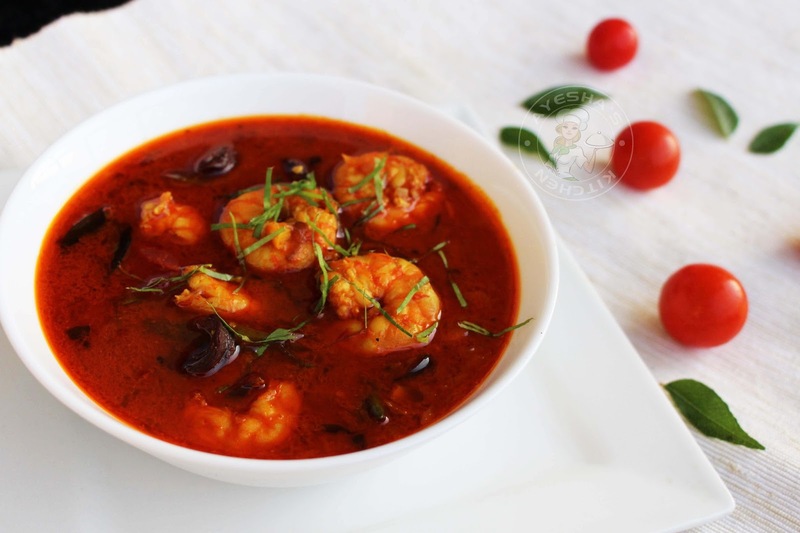 Last week i got some fresh king prawns and i thought of making a special shrimp masala recipe for lunch. As i feel lazy to cook both curry and side dish , i changed my plan and made this hot gambooge prawns curry . Do try this recipe for curry shrimp and serve it along with hot rice. It is an irreplaceable curry shrimp recipe. Here is the recipe showing how to make kudampuli chemmeen curry / gambooge shrimp curry /easy shrimp curry recipe / Prawn curry goan /hot curry recipe / curry shrimp recipe. Wash and clean the prawns well. You can add a teaspoon of vinegar and salt while washing the prawns. Drain it and set aside. Heat a pan or clay pot with oil. Add in mustard seeds and fenugreek seeds. Let it splutter. When done add chopped garlic and green chilies slit, saute for a while. Then add shallots. Saute it until shallots become soft and slightly golden. Now reduce the flame to very low and then add chili powder, turmeric powder, coriander powder. Saute very well until it is well combined. Add in cherry tomato and gambooge along with soaked water. Mix well. Let it cook until the tomato becomes mushy. Add salt and mix well. When done, add 1.5 cups of water and bring it to boil. Now make the flame very high. Let it cook well until the oil floats on the top. When done, check for salt and then add the cleaned prawns. Cook for 10 minutes over a medium flame. When the prawns are done, remove from flame. Heat a pan with a table spoon of oil (preferably coconut oil). Fry the chopped shallots and curry leaves. Pour it over the prepared curry for seasoning the curry. Close the lid and better serve after half an hour for the best flavor ever.